Lake Oswego Mayor Kent Studebaker had a surprise for the hundreds of people who gathered at Foothills Park on Memorial Day to honor fallen soldiers and first responders. 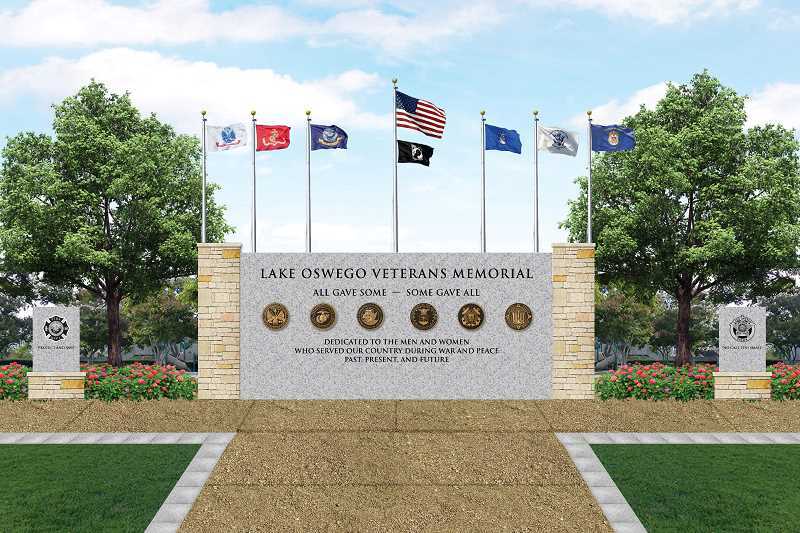 With most of the City Council standing by his side, Studebaker announced on May 28 that the City would contribute $50,000 in tourism funds to a proposed Lake Oswego Veterans Memorial in Foothills Park — enough for the project to break ground soon and possibly be completed in time for Veterans Day in November. "It's important not just for the fact of the toursim money being appropriate, but mainly because it brings this project to fruition," said former City Councilor Karen Bowerman, one of the volunteers who has worked to make the memorial a reality. "We're about the only city remaining in Oregon without a memorial for veterans and first responders, so it was really important Lake Oswego came onboard with this." When it's completed, organizers say the Lake Oswego Veterans Memorial will be a somber but beautiful place of reflection and celebration. It will sit in an open field between the parking lot and a walking path in Foothills Park, just south of the covered picnic shelter. Current designs call for a granite wall approximately 10 feet tall by 20 feet long, engraved with a dedication that says, "To the men and women who served our country during war and peace. Past, Present. And Future." It will also bear a quote from Purple Heart recipient and Korean War veteran Howard Osterkamp: "All gave some — Some gave all." Poles flying the American flag, a Prisoners of War remembrance flag and flags representing each branch of the U.S. Military will stand behind the wall. Two smaller monuments dedicated to first responders will flank it, and benches will be placed nearby. According to organizers, the designs are subject to change as the project works its way through the City's approval process. But Bowerman said she and the rest of the nonprofit group were nevertheless pleased to learn about the City's donation, because it kickstarts a process that has been underway for more than three years. Bowerman said she believes the use of tourism dollars to help fund the project is fitting, because the wall — and the patriotic events that will likely be hosted there — will become an attraction for Lake Oswego. In an email to project organizers last week, she said many of the people she met on Memorial Day had come to Foothills Park from outside the city. City Councilor Jackie Manz agreed with Bowerman. Manz played a key role behind the scenes in securing the new funding for the memorial and says she believes the project is a great use of the City's resources. "I'm delighted for (the memorial) group. I'm delighted for our citizens — those who have served and every family who has had a member serve — that there is a way to show honor to them," Manz said. "As a citizen and councilor, I think it's important that we respect our people who have served — some of whom may not have had a choice, some who had a choice, the point being that they served." Manz noted that the City has played a key role in the development of the memorial, a public-private partnership that officially started in June 2015 with a presentation to the Parks, Recreation and Natural Resources Advisory Board. "This has been a long process," she said. "Besides the grant announced at the Memorial Day event, the City has donated land and staff time to work with the Veterans Memorial group. The catalyst (for the donation) is the fact that they raised a sufficient amount of money on their own, and this was part of an ongoing dialogue with this group in order to (see their vision through)." The City's donation, combined with $48,000 already raised, puts the project close to its initial fundraising goal of $100,000. However, board members say that engineering, construction and design costs will most likely increase the overall price tag of the project. For that reason, they plan to continue fundraising efforts while design details, construction bids and other variable costs are finalized. In the meantime, visitors to this year's Memorial Day event got a glimpse of the site where the Veterans Memorial will soon stand and heard a series of speakers talk about the importance of paying tribute there to those who served. Lake Oswego Police Capt. Dale Jorgensen, who will become the department's chief on July 1, talked about the reality of celebrating his first Memorial Day without his father, a veteran who recently passed away. Retired Air Force Gen. Merrill "Tony" McPeak noted that a flag that once covered the casket of City Councilor John LaMotte's father flew over the gathering. 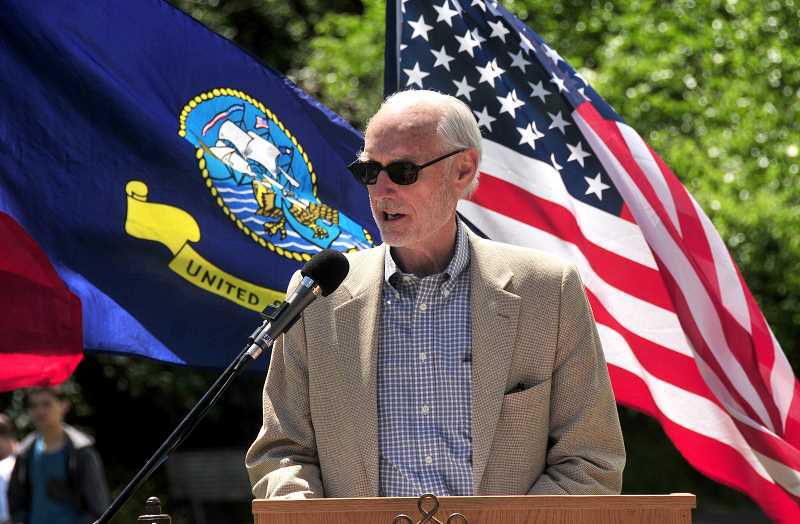 McPeak also recounted the country's history of involvement in wars and reminded the crowd that the soon-to-be-built granite monument was "not a war memorial, but a tribute to those we ask to fight our wars." Assistant Fire Chief David Morris echoed McPeak's thoughts, offering a "special thank you to the brave men and women we solemnly pay our respects to this Memorial Day." "Because of their courage, devotion, discipline, sacrifice and loyalty," Morris said, "our way of life has been preserved."